Esri has become a participant in the Global Earth Observation System of Systems (GEOSS) program, one of the most comprehensive efforts to monitor the earth. Group on Earth Observations (GEO), a voluntary partnership of 89 countries; the European Commission; and 67 intergovernmental, international, and regional organizations, works together to coordinate and share earth observation data and science. The group was formed to meet the critical need for improved, near-simultaneous observation of the planet. 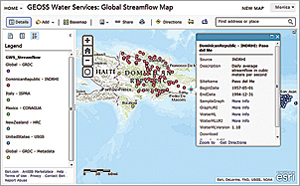 Global streamflow map developed as part of the 6th GEOSS Architecture Implementation Pilot (AIP-6) initiative. 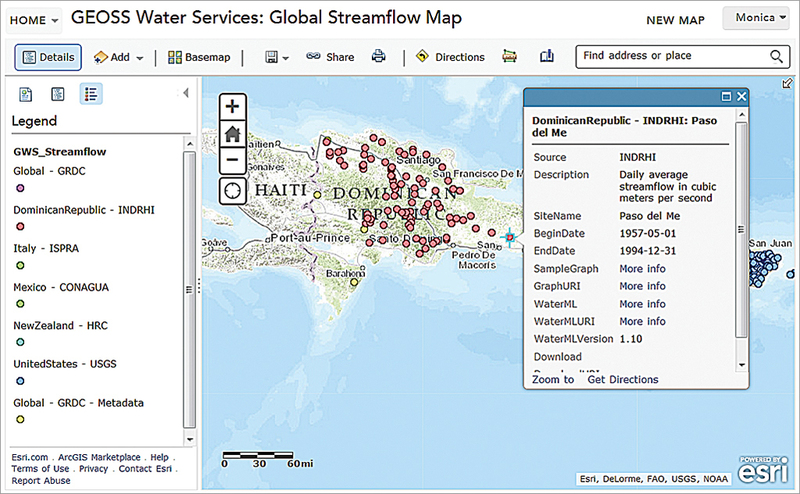 Each marker is linked streamflow data published in Water Markup Language (WaterML). Web map was created by Fernando Salas. The GEOSS program brokers various forms of earth observation data and information via its online platform Discovery and Access Broker (DAB). The platform connects relevant information systems and infrastructures throughout the world. Many GEOSS contributors, such as the European Environment Agency, United Nations Environmental Program, and the Food and Agriculture Agency of the United Nations, already use Esri technology in their services, making their systems and data inherently interoperable. Esri is making GEOSS earth observation data and services available to the ArcGIS Online community. This collaboration will make ArcGIS Online a significant part of DAB's infrastructure. ArcGIS Online subscribers can discover and access the resources published by GEOSS, use GEOSS data services, and build applications. A memorandum of understanding (MOU) between Esri and the Earth and Space Science Informatics Laboratory (headed by Professor Stefano Nativi) at the National Research Council of Italy Institute of Atmospheric Pollution Research (CNR-IIA) has created a partnership between the two organizations. Per the MOU, CNR-IIA and Esri are designing brokering arrangements and direct dataset access technologies as well as open standards for data interoperability and cataloging. "GIS becomes a platform for understanding, when users build on top of knowledge and measurements with the system to share new ideas," Esri president Jack Dangermond said. "We are trying to create understanding out of measurement, knowledge, and science so that people can act. These measurements provide the basis for interpreting science for design work such as land-use planning." CNR-IIA and Esri are building two-way technology between the GEOSS DAB framework and ArcGIS Online using the ArcGIS Online API. Developers will engineer Esri and DAB interfaces and build interoperable web services that connect the two systems via pathways. One pathway starts from an Esri portal and leads the user to discover the main systems of services provided by GEOSS. Through the DAB, ArcGIS Online users will access GEOSS networks such as DataOne, Committee on Earth Observation Satellites (CEOS), the Consortium of Universities for the Advancement of Hydrologic Science, Inc. (CUAHSI), OneGeology, and the Integrated Ocean Observing System (IOOS). Another pathway starts from the GEOSS portal, leading the user to discover Esri services. All public content from ArcGIS Online, such as Esri basemaps and imagery and contributed datasets and maps, will be discoverable through the many search portals in GEOSS. Users can lay operational data from the GEOSS on authoritative Esri basemaps and other ArcGIS Online datasets. This allows specialized communities to analyze their data within the framework of a common geography. Dangermond said, "GEOSS serves as an earth measurement platform for monitoring change on the planet. Making GEOSS content available in ArcGIS Online increases opportunities for scientists and other communities to visualize information in greater context. Moreover, because the platform supports authoritative and crowd-sourcing information, GEOSS members can build networks into other disciplines." However, the interconnected nature of earth systems will make designing technology that bridges disciplines challenging. Data capture, measurement, and quality differ across both disciplines and sensor systems. Data management practices also vary. Esri and CNR-IIA considered these factors when formulating objectives for a platform design that would not require scientists to spend time learning and modifying technology. The first objective was the development of a specialized search engine for discovering datasets that allows users to obtain raw data accessible in a remote workstation or server environment. The second objective was the design of a flexible architecture that supports continual inclusion of interoperability with DAB. The third objective was to devise tools to transform data services that can integrate sets of measurements. The GEOSS and ArcGIS Online service is unique because the relationship between GEOSS and Esri is different from the scientific relationships between government and public agencies. Esri, a private company, operates ArcGIS Online and has more flexibility than government-driven platforms or single government initiative programs. In addition, ArcGIS Online is a repository for geospatial and imagery data for the entire planet, not just a specific region or area of interest. The data shared by hundreds of thousands of organizations in ArcGIS Online does not belong to Esri but to those organizations. GEOSS brings many scientific communities together. Bringing GEOSS data into ArcGIS Online will help these communities extend their scope and work together to meet some of earth's critical challenges. For additional information about GEOSS, visit EarthObservations.org or geoportal.org.